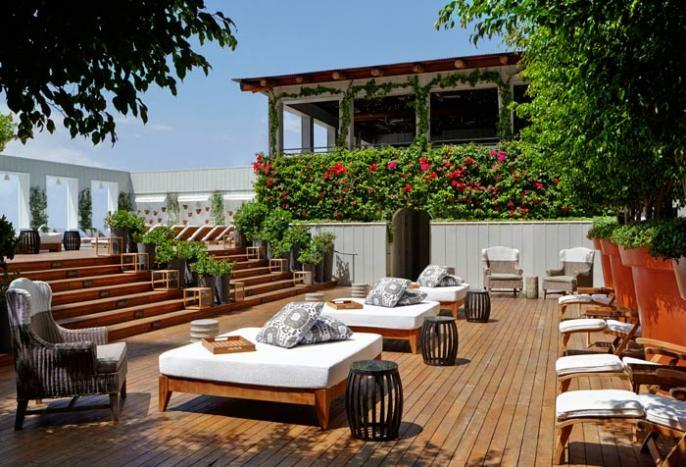 Boasting some of the finest views of Los Angeles, Skybar is an open air, ivy-covered pavilion perched above the Pool at Mondrian Los Angeles. Having been the spot for the hottest nightlife and bar scenes from the day it opened, Skybar’s newly re-imagined design brings a fresh approach to this iconic space. A chic poolside lounge by day, Skybar provides an idyllic oasis to take in the sun and enjoy impeccably fresh cocktails. When the sun sets, the pulse of Skybar beats even louder, stirring a seductive energy, aroused by world-class DJs and Hollywood glamour. Skybar is private to hotel guests every day until 1PM.